In challenged patients, let our certified experts perform your difficult IV starts. Working with the PICC Team frees up valuable time for your own nursing staff, eliminates frustration, and minimizes patient discomfort. Most importantly, patients receive necessary medications without delay - expediting their recovery and helping them return to their optimal level of living and comfort. The PICC Team can also eliminate the medical complications that can occur if an untrained staff member unsuccessfully attempts a removal - such as catheter breakage or damage. This also eliminates risk of potential liability to your facility. The PICC Team is available for triage 24/7. We strictly adhere to all policies and procedure set forth by the Infusion Nurses Society and the Centers for Disease Control. 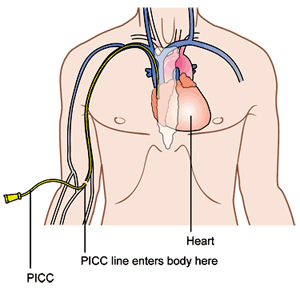 A PICC line (Peripherally Inserted Central Catheter) is inserted into a vein, then threaded within the vein to terminate just above the heart in the superior vena cava, where it can provide intravenous access for up to 6 months or longer. Useful for infusing irritating drugs. Most potent IV drugs can be irritating to the walls of a smaller vein in the arms and hands - which can create swelling, leaky veins and ultimately lead to patient pain and discomfort. PICC lines are compatible with most infusion fluids including antibiotic therapy, chemo agents, TPN, lab work, pain medications, blood transfusions, hydration, and other vesicant meds. Termination just above the heart eliminates problems with drug irritation. Lengthy indwelling time (6 months or longer). No other IV method can achieve such longevity. This results in the need for fewer IV sticks, a savings in staff nursing time, and fewer interruptions in patient care. 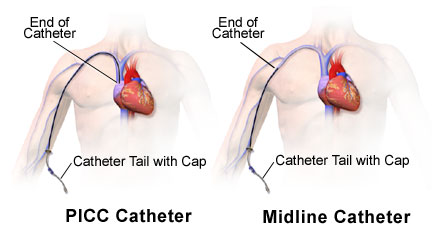 What is a Mid-Line Catheter? A mid-line catheter is a less-invasive alternative for patients requiring IV access for less than six weeks. Mid-line catheters provide an alternative route for antibiotics, hydration, and most non-vesicant medications. Can be used immediately upon insertion, without X-ray verification. Mid-lines and PICC lines can sustain damage from the patient, require declotting or other improvements to flow. With our experience, the PICC Team can usually make repairs and prevent expensive trips to the hospital. In cases where the catheter cannot be repaired, we can exchange it in minutes at minimal expense. Access veins higher up the arm - ideally above the antecubital space - for comfort and longevity. By locating the access out of the way of everyday bedside procedures, complications are minimized. 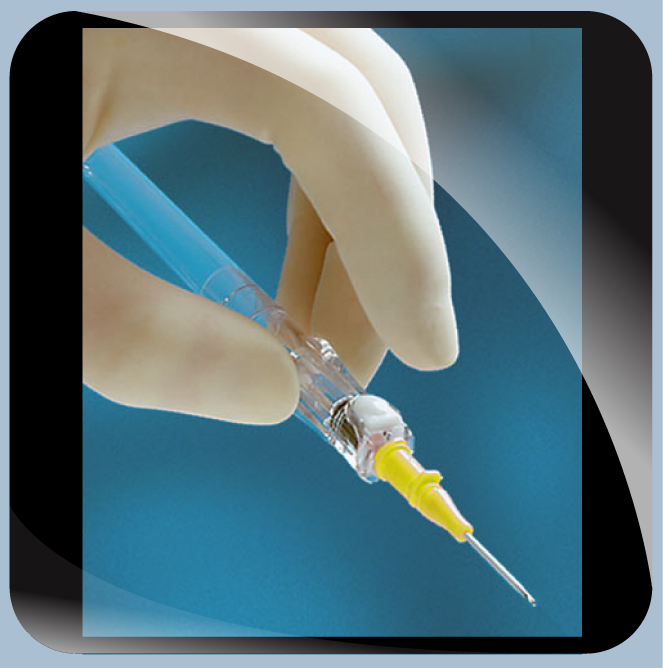 Achieve first-stick success and improve success rates for insertions. Simplify the location of veins and increase the ability to cannulate veins - especially valuable since much of the patient population suffers medical complications that impede vascular access. Determine the veins from the arteries to eliminate accidental arterial punctures. We can provide hospitals with a quality peripheral line program that minimizes the hospital's need to maintain special staff and equipment. Plus, working with the PICC Team reduces liability and education costs. Radiology? There is a financial penalty when using radiologists to insert peripheral lines. A more efficient use of radiology resources is to use those beds for other procedures. Bedside-Care RNs? Using bedside care RNs to insert peripheral lines can inadvertently pose a risk to quality of care and needlessly waste valuable staff time. Whenever you find a patient in radiology involving a peripheral line, it indicates that a bedside nurse first tried the traditional methods, and ultimately wasted his or her time. Time savings involves more than nursing staff: using the PICC Team for peripheral line therapy at the bedside eliminates transports to Interventional Radiology. And, with same day placement, may even shorten the patient stay. When the PICC Team performs peripheral line services at the bedside, the facility sees a dramatic increase in efficiency from: elimination of transport via ambulance, reduced staff time, reduced liability, lower training costs. Patients themselves experience greater comfort and satisfaction from a virtually painless procedure, enhanced with the use of lidocane.